Chuck Jones? Einstein? Wile E. Coyote? 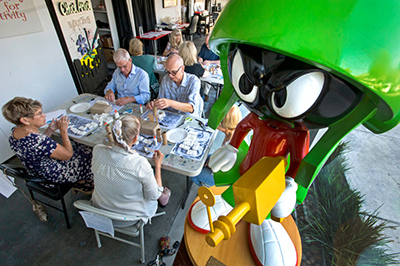 A nonprofit boosts the common thread — imaginationWonderful article in Friday's OC Register about the Center and the work it does. If you ever wondered what the Center is all about, this article will tell you. Craig Kausen has a crazy childhood memory of his grandfather, Chuck. It takes place in the summer of 1972 in the backyard of Chuck’s Cameo Shores house in Corona del Mar. Craig was 10 years old. His brother Todd was 11. Chuck told his grandsons to put on some swim fins. Then he tied them up with twine at their ankles, their knees and their elbows.